The many well-known health benefits of ginger can be attributed to its active constituents. Preliminary ginger research and studies have identified at least 115 constituents that are present in dried and fresh ginger, most notably gingerols, shogaols, and zingerones, all of which are pungent phenol compounds. In its raw form, ginger has the highest levels of gingerols. Dried ginger has extremely high levels of shogaols, and when cooked, many of the gingerols in ginger break down into zingerones. You can benefit from the majority of ginger's properties by consuming it in its raw form; these benefits include some of its nutritional content, especially vitamin C, as this vitamin is significantly reduced when the root is exposed to prolonged heat, light, or storage. The most used part of the ginger plant, scientifically known as Zingiber officinale, is its underground stem or rhizome - commercially called root - which is beige on the outside with knotted appearance and bright yellow on the inside. The aerial parts of the plant consist of a stem that sticks up approximately 12 inches (30 cm) above ground, with typically long, green, narrow, ribbed leaves. Separated, shorter stems bear ginger flowers, which are pale yellow with a purplish lip that has yellowish dots and striations. However, flowering stems are rare in cultivated plants. According to the codex standard established by the Food and Agriculture Organization of the United Nations and the World Health Organization, the weight for commercial ginger root should be within the range of 150 - 300 grams. It also should be mostly free of any skin defects due to rubbing, early signs of sprouting, pest markings, traces of soil, and bruises. 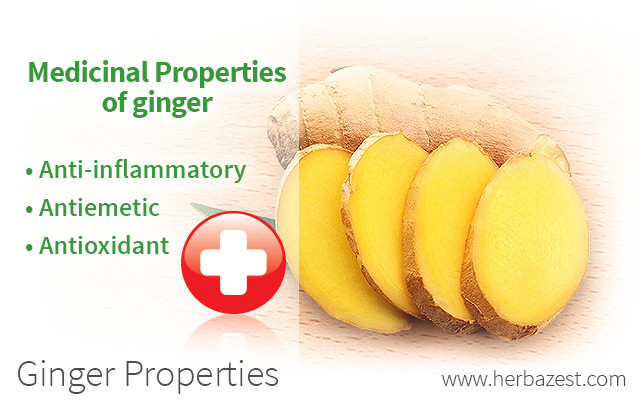 This international standard was established to preserve all the wonderful medicinal properties of ginger. Based on a 2,000 calorie diet, raw ginger root is not the greatest source of nutrition. However, ginger vitamins and mineral content - such as vitamin C, potassium, and magnesium - can complement your daily diet, since they are necessary for many basic biological processes in the human body. Vitamin C. This vitamin is an important antioxidant that helps to block and prevent damage caused by free radicals in the body. Since this water-soluble vitamin isn't stored in the body, it's important that you get enough of it in your diet. Lack of vitamin C has been associated with a number of health issues, including high blood pressure, stroke, and in severe cases, even scurvy. Raw ginger contains 5 mg of vitamin C per 100 g.
Potassium. This mineral is an important electrolyte that conducts electric impulses in the body and is crucial for the proper function of cells, making it key for smooth muscle contraction, digestive function, and heart health. There are approximately 415 mg of potassium per 100 g of ginger. Magnesium. Magnesium is a mineral that is essential for the healthy function of every organ in the body, especially the heart, muscles, and kidneys. This mineral also helps to regulate the levels of other vitamins and minerals in the body and contributes to energy production. There is approximately 43 mg of magnesium per 100 g of ginger. The various medicinal uses of ginger validate its effectiveness as a powerful healing herb, with anti-inflammatory, antiemetic, and antioxidant actions attributed to its high levels of gingerols and shogaols. Among the many properties of ginger, soothing nausea and easing vomiting have been the best known and used through history. Research has found that ginger is more effective than both placebo and dimenhydrinate in treating motion sickness and pregnancy-related nausea, and a good way to alleviate both health issues is by sipping a hot cup of ginger tea. The different applications of ginger for inflammation have proven effective in decreasing swelling and pain. For centuries, ginger has been successfully used for countering headache and migraine pain, and it has also been shown to reduce the symptoms of arthritis. In a study from Arthritis and Rheumatism (2001) ginger extract was shown to significantly decrease the symptoms of osteoarthritis of the knee. Preliminary research suggests that ginger may be a useful agent for lowering cholesterol and blood pressure. Furthermore, it may help to prevent blood from clotting and can therefore be taken to prevent heart attack and stroke. Additionally, one of the most important medicinal properties of ginger is its ability to reduce oxidative stress by combating the action of free radicals in the body, which has been linked to many serious health issues. For the above mentioned reasons, ginger makes a great addition to your diet. While eating fresh, raw ginger is the best way of reaping all its health benefits, you can also get its medicinal properties by consuming it dried, with food, or choosing from a widely available variety of ginger supplements.